The two line-ups for the All-Star match at The International 5 have now been decided, with Cloud9's Johan 'BigDaddyN0tail' Sundstein and Invictus Gaming's Wong Hock 'Chuan' Chuan the two captains. BigDaddy's all-star team will see Arteezy team up with his EG replacement SumaiL, while Team Chuan includes Secret's Clement 'Puppey' Ivanov. We're interested to hear your thoughts on which team you will be supporting. BigDaddy was on the winning team last year, Team Rotk, who played against Team XBOCT in the best-of-1 which was also the grand reveal of Valve's new hero Techies. 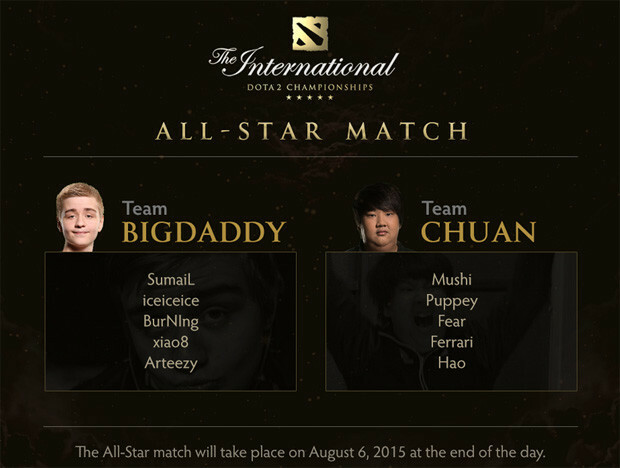 Six of the twelve players involved last year make a return at the TI5 showmatch, with notable absentees being Danil 'Dendi' Ishutin and Gustav 's4' Magnusson who did not make the selection.The players were decided via a public vote in the TI5 Compendium, and the All-star match will be played on the 6th August, the fourth day of the main event.